The International Society on Thrombosis and Haemostasis recommends avoiding the use of direct oral anticoagulants (DOACs) in patients with a body mass index (BMI) greater than 40 kg/m2 or weight greater than 120 kg. Higher BMI is associated with altered pharmacokinetics which may affect the safety and effectiveness for DOACs. Data were collected on 3458 patients taking a DOAC prior to admission to a Midwestern health system between February 2013 and August 2016. Of these, 43 patients had a thrombotic event and 70 patients had an overt bleeding event. Patients were stratified among the following three BMI groups: BMI < 30 kg/m2, BMI 30–40 kg/m2, and BMI > 40 kg/m2. There was no statistically significant difference between BMI groups for thrombotic events (p = 0.598) or for overt bleeding events (p = 0.065). The BMI < 30 kg/m2 had the highest occurrence rate of bleeding events. It was observed that bleeding occurrence decreased as the BMI groups increased. 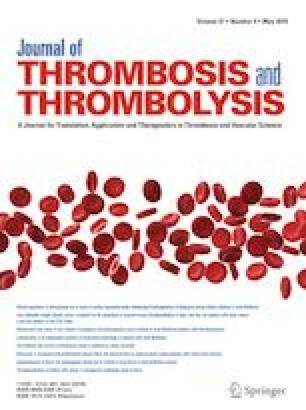 The BMI > 40 kg/m2 group had the lowest risk of bleeding events, and was the only group to have a higher occurrence rate of thrombotic events compared to bleeding events. Among patients admitted to a single health system on DOAC therapy over a three-and-a-half-year period, obesity did not significantly correlate with thrombotic or overt bleeding complications. This study is limited as a single health system study with low overall event rates. A preliminary finding of this study showed a trend towards decreased bleeding frequency as BMI increased. Sarah Meeks for mentorship & Sarah Ferrell and Christopher Liston for aiding in data collection. Dr. William Wilson is a member on the Eliquis® Advisory Board but accepts no financial contributions. No financial support or grants were used to fund this study. All funding was done by Parkview Health. Body mass index – BMI. Euro.who.int. http://www.euro.who.int/en/health-topics/disease-prevention/nutrition/a-healthy-lifestyle/body-mass-index-bmi. Accessed September 23, 2018.